License Day — On Monday the magistrates met to decide applications for transfers, &c, for houses of accommodation, when we understand the majority of those made were granted. It is some satisfaction to know that the inconsistent objections to the licensing the late Harrow Inn are removed, and that that house has very properly been again licensed. 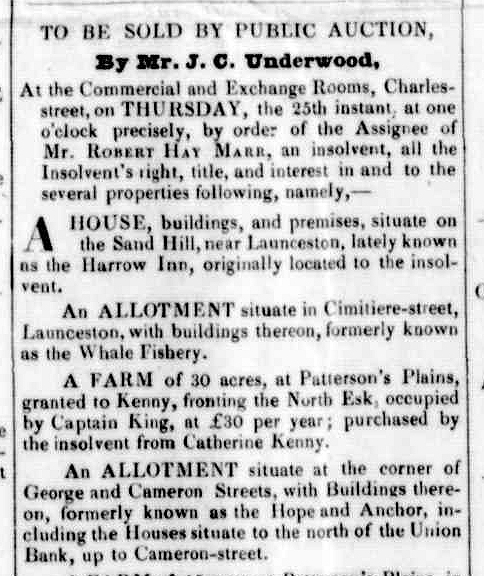 We must confess we feel a pleasure in learning that the objections to the licensing of the Harrow Inn have been removed, and that, by the house being licensed, the public will no longer be denied the accommodation the house in that situation affords, and which is so much desired. We do not hesitate, now the house is licensed, to state that the public has assigned as a reason why the license should be refused upon application for the house, that Mr. Gilles and Mr. Oakden have land contiguous to it, and on that account is it said, that a license was re fused. We have too high an opinion of these gentlemen to suppose that they would permit their private matters to clash unfavorably with the public interests. 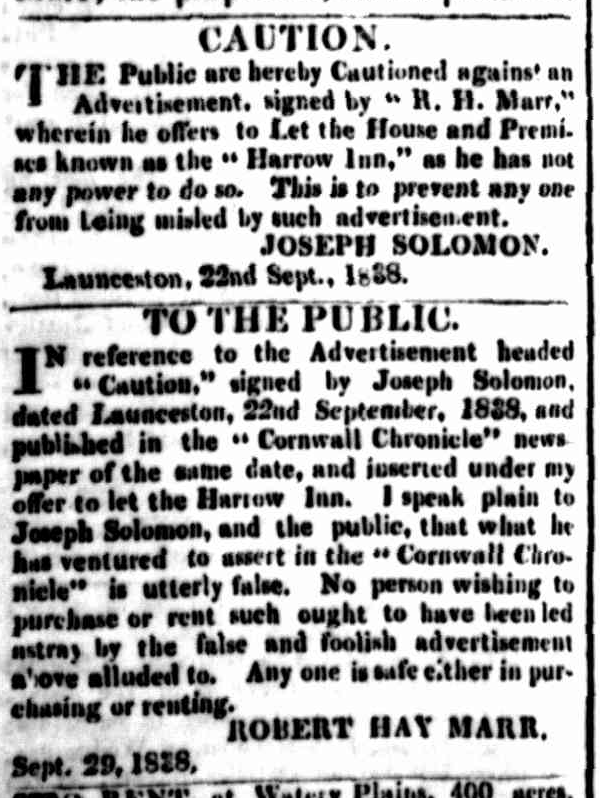 Situated with the public as are Mr. Gilles and Mr. Oakden, we are glad to see, that by licensing the Harrow Inn, the case for the illnatured remarks is done away with ; and we hope that in future, under any circumstance, licenses to houses which are really of public advantage, may not lie made the sport of magistrates or any other functionaries. William Bourne, Travellers Rest, Sandhill (formerly the Harrow Inn); refused on account of situation. Mr. Corbett. of the Green Gate [at Sandhill], was also given to understand that, for the same reasons, his house would be licensed for one year only, at the expiration of which time it would not be renewed. A CORRESPONDENT requests us to notice the Wattle trees on the sides of the main road, as being a hiding place for runaways and foot-pads, some time ago we called upon the authorities to remove these trees. Again we urge the necessity of so doing before the dark Winter evenings come, particularly in one or two bye places between Launceston and Perth. The old “Harrow Inn” used to afford a protection to a very dismal turn in the road just over the Sand-hill, but as It is now in a very delapidated state not having a tenant, and all the windows having been removed by the proprietor, for their safety ; it affords an excellent shelter to bush-rangers or other persons who choose to take up their quarters therein. How much better both for the protection and accommodation of travellers would it have been had the Licensing Magistrates have granted a license to that house, it would now have been a respectable residence, instead of the dismal and dilapidated appearance it now has. Licensing Day. — On the usual annual licensing day, Wednesday last, a large assemblage of magistrates took place at the Court House, to renew licenses and determine on fresh implications. Not one house lost its license, but several applications for license fur new houses were refused. The licensed houses were represented as orderly and well conducted generally. 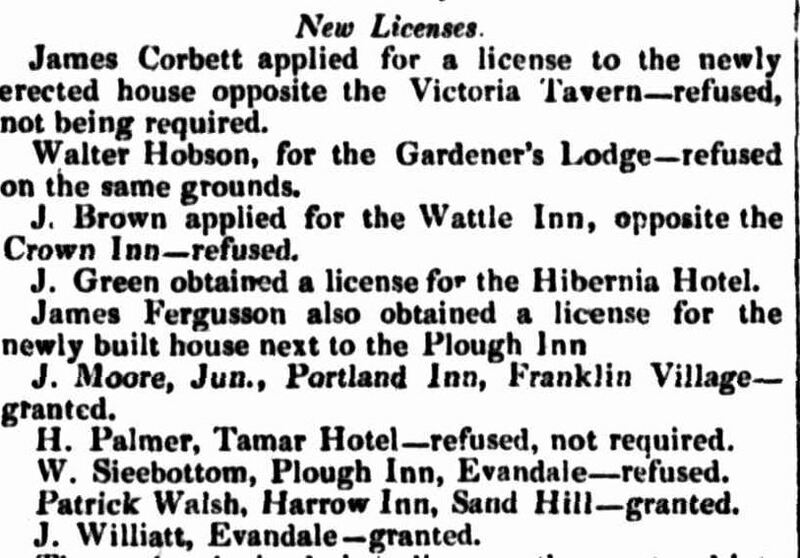 The Harrow Inn, formerly Mr. R. H. Man’s, on the main road, a license for which has been refused for three years, was relicensed. Mr. Thomas Archer, formerly proprietor of the Air George Arthur Inn, applied for a license. The application was at once negatived, on account of the loose manner in which he formerly conducted his house on the Sand Hill. LIGHTNING.-During the late storm time “Sir George Arthur” Inn, at the Sand-hill was struck by lightning. The sign board was riven, and fell to the ground, but no other damage ensued. MALICIOUS PROCEEDING.-On Wednesday morning Mr. Waycott, of the Sir George Arthur Inn, on the Sand-hill, discovered fire issuing from the roof of his house. He immediately investigated the cause, and ascertained that a piece of ignited canvas had been thrust under the shingles. A portion of the sign board and shingles were destroyed before the fire could be extinguished. There is reason to believe that this is the work of an’ incendiary, and Mr. Waycott offers ten ponds for the apprehension of the offender. Suspicion rests upon one party. On the previous eventing a similar attempt was made to destroy the premises known as the Edinburgh Castle, kept by Mr. Reading. SAND HILL TOLL GATE.- The Lieutenant Governor has proclaimed the removal of the Sand Hill Toll Gate on the main road to n place near the Sir George Arthur Inn, about one mile and flity-seven chains from the boundary of the town of Launceston. From Richard Waycott, Sir George Arthur Inn, Sand Hill, to William Gaylor. The police magistrate saw no objection ; the change could not be for the worse. Granted. 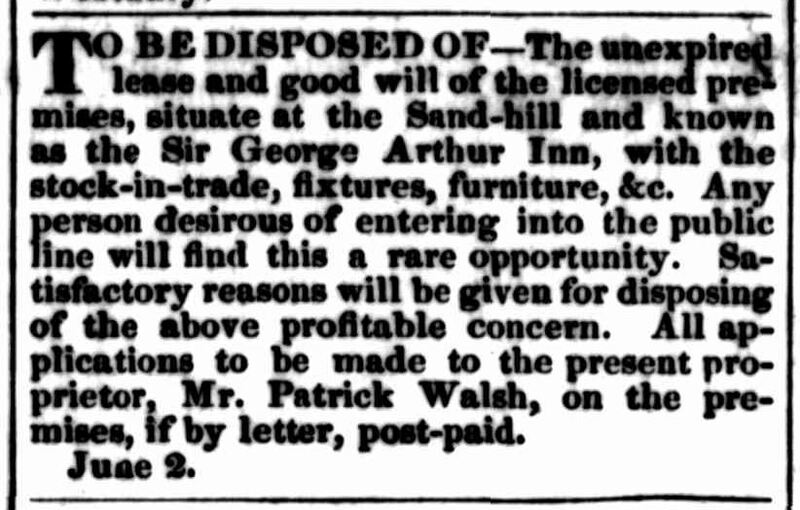 The transfer of the license of the Sir George Arthur Inn was granted from Wm. Gaylor to George Order. The Police Magistrate said he felt himself bound to make some remarks in connection with this house. He said it had been conducted from “bad to worse.” He trusted the applicant for the transfer would keep it circumspect : if he did not, he should take strong steps to make him do so. 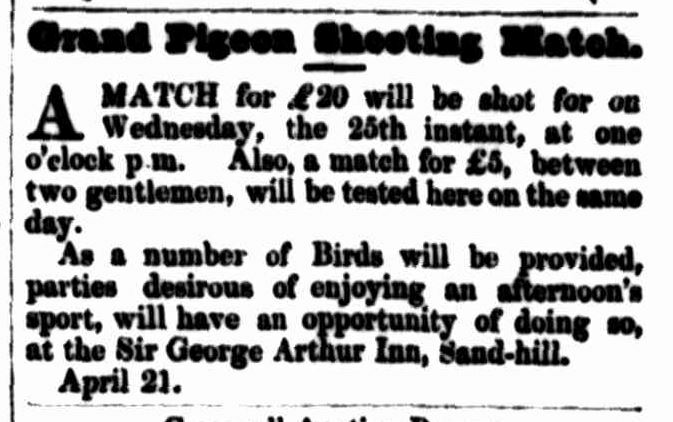 George Horder, Sir George Arthur Inn, Sandhill. It was said that the premises required some repairs. Mr. Rocher requested that this application might stand over, as Mr. Horder had applied for a license for his own house at King’s Meadows, and if that were not granted the present application could be considered. This course had been taken on a former occasion. 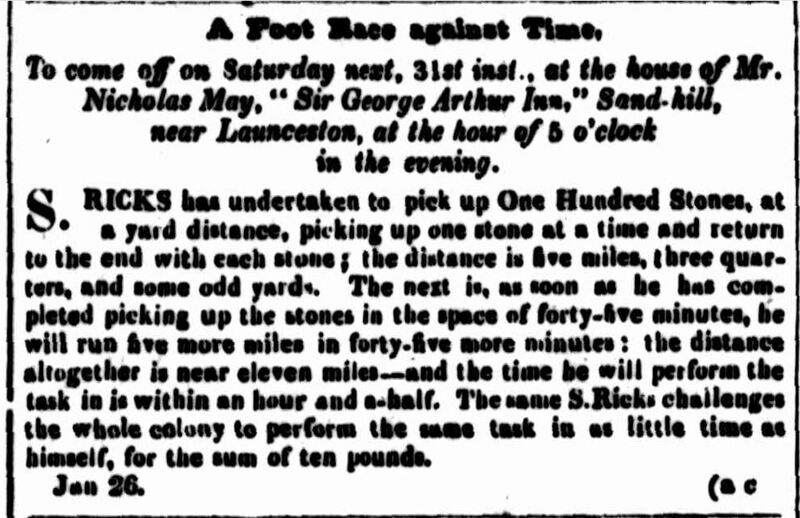 Mr. Douglas did not recollect of any such precedent having been made, and on behalf of the owner of the Sir George Arthur Inn, he objected to such a course being taken. The magistrates were bound by the Act to take into consideration the applications for renewals of old licences first, and then to hear applications for new licences. It would engage that all the necessary repairs should be effected. Granted. The Mayor said that applicant had got a certificate for the “Sir George Arthur” Inn at the last annual meeting. Mr. Rocher, who appeared to support the application, said that Mr. Horder had certainly obtained a certificate, but he did not take it up, and the “Sir George Arthur” was shut. 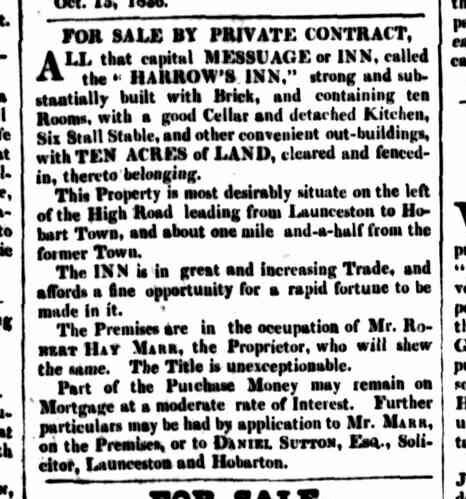 The “Swan Inn” would be much more suitable for the purpose, both as regarded situation and accommodation. 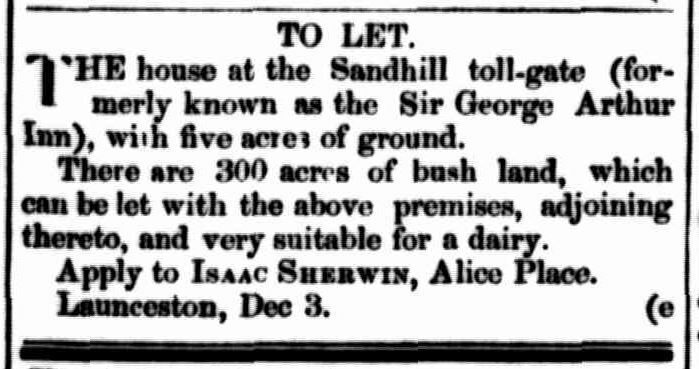 The representatives of Solomon’s estate, to which the “Sir George Arthur Inn” belonged, had withdrawn their opposition to applicant’s having his new house licensed. Mr Douglas did not think that Mr. Rocher should say that the representatives of Solomon’s estate had withdrawn their opposition. Mr. Rocher said he was given to understand that they had. 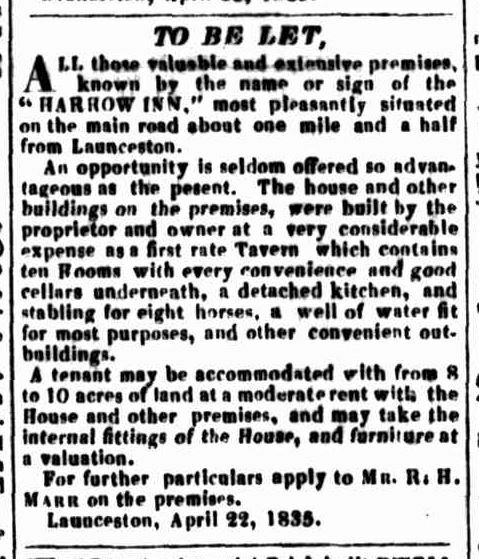 Applicant said that he could not make a living at the Sir George Arthur, the lease of which still had some eighteen months to run. He had informed both the trustees, Messrs. Sherwin and Kirkby, of the fact, and intimated Ilia intention of applying for a now license. The Mayor said that there was very strong opposition by the trustees who had employed counsel, at the annual meeting. Mr. Horder then said that the house was in a dilapidated state, and on the understanding that the trustees should effect the necessary repairs the license was granted. Mr. Rocher said that if the trustees had wished to oppose the application on this occasion, they would have employed counsel, but no one opposed it on behalf of the trustees. Mr. Horder was under no covenant with the trustees to keep the house licensed. After some further discussion the application was granted. Fire at King’s Meadows.— On Saturday morning, we are informed, the old Sir George Arthur Inn, at King’s Meadows, was destroyed by fire. The place was occupied by Mr Machen, and on the fire being discovered a number of the neighbors went to help, but on attempting to draw water from the well the rope broke, and they were unable to obtain any. They then proceeded to strip the house of its contents, together with the doors; sashes, etc., and by those means saved as much as it was possible, to save. The house was a very old one, belonging to Solomon’s estate, and many years’ ago was one of the chief hotels on the main road. It is generally known that the toll-gate was at King’s Meadows, somewhere about where Quigley’s store is now. The Sir George Arthur Inn stood on a bank on the town side of it. This entry was posted in Hotel, Kings Meadows, Sandhill by Xenith. Bookmark the permalink.